Now, the story turns for the worse. When Chrysler received the unit and looked at it they realized something was wrong. The shaft on our unit was shorter than their failed unit. Their drive had a special extendend output shaft. It was extended by nine inches and our unit would not work in their conveyor application. They immediately sent the unit back to us. Our service team disassembled the entire gearbox to remove the output shaft. 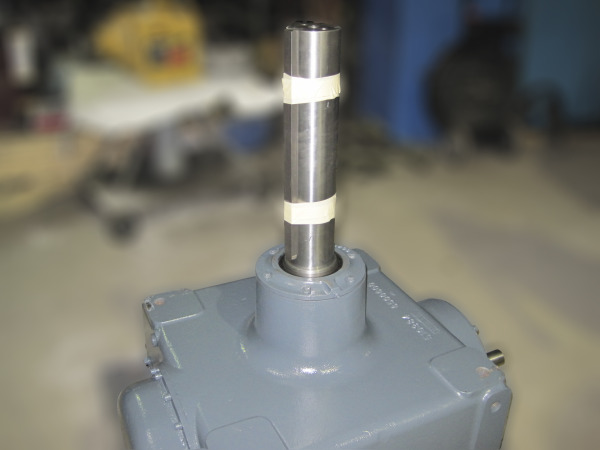 Our in-house machine shop would need to fabricate a new shaft from 4140 bar stock. We would need to turn down a shaft from 8" diameter to as small as 3-15/16" diameter. The output shaft on the 5DTC3 is a complicated shaft with multiple steps, keyways and threaded keeper holes. This machining process would take several hours. The plant was ok with this and requested we also supply a replacement sprocket for the conveyor drive. The customer needed an D160BS18 but we did not have stock. However, we had a Martin D160B16 sprocket in stock and we bored it open to 3-15/16, keyed and added setscrews to mount on the reducer. We worked all Friday night and had the new shaft back into the drive and shipped it to the plant early Saturday morning. While the plant was down longer than we or they would have liked. B&H was able to shorten the 12 week factory lead time into hours and save the distributor and the plant thousands of dollars on the Falk Speed Reducer and the Martin Sprocket. In fact, we also received an order for a second Falk 5DTC3 with custom shaft and an additional sprocket as a spare. We repeated the process to machine the replacement shaft. We fabricated the D160B16 from two 'A' plate sprockets and shipped the order later that week. The 5DTC3 like most of the large Falk reducers are extremely well designed and run for years. Because of this, when they do fail many plants are caught without a spare. This is why B&H continually grows our inventory of large and hard-to-find geardrives and speedreducers.